ENSENADA, Mexico—After the dust settled early Sunday morning and the vehicle tracking devices had been reviewed, popular action sports TV announcer/desert racer Cameron Steele was officially awarded the overall 4-wheel vehicle and SCORE Trophy Truck race victory at the epic 51st SCORE Baja 1000 in Ensenada, Baja California, Mexico. Finishing second physically behind apparent winner Rob MacCachren, Steele was later awarded the victory after MacCachren was penalized for a course infraction. Steele finished the radically challenging 806.76-mile race in 16 hours, 24 minutes, 02 seconds in his No. 16 Monster Energy Desert Assassins Geiser Bros. built Ford Raptor with an average speed of 49.19 miles per hour. The race was also deciding the coveted season point championships in Pro and Sportsman classes for cars, trucks, UTVs, motorcycles and quads in the season-finale of the four-race 2018 SCORE World Desert Championship. 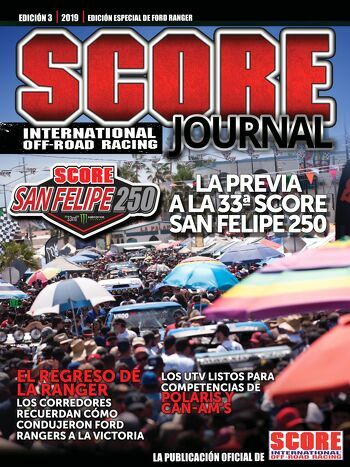 Final official results were released by SCORE race officials after the course closed, all data-tracking devices had been read, penalties assessed and confirmed by the SCORE Competition Review Board late Sunday morning in Ensenada. The race was the season-finale of the four-race 2018 SCORE Desert World Championship. The world’s most iconic, oldest, prestigious and longest continuously held desert race, this year’s epic 51st SCORE Baja 1000 was held over a rugged 806.76-mile race course over the Northern part of Mexico’s majestic Baja California peninsula, starting and finishing in Ensenada, Baja California Norte. The week was a heart-warming, memory-building, risk-taking, nostalgic celebration of the world’s most iconic desert race—the legendary Granddaddy of all Desert Races. Pre-race festivities and the start/finish line area were held in Ensenada, 80 miles south of the U.S. Border at San Diego. For the No. 16 Monster Energy Desert Assassins Ford Raptor built by Geiser Bros., Las Vegas’ Pat Dean started the race and drove to race mile 538 and Steele drove the rest of the way. After 13 years racing in the marquee SCORE racing division for high-tech, 950 horse-power unlimited custom trucks, Steele, 50 of San Clemente, Calif., won his second career SCORE Trophy Truck race and second straight after winning in Tijuana in September. Both drivers drove a steady pace after starting in 12th spot in the class. Biding their time, they were there when they needed to pass all but Rob MacCachren to end up earning the SCORE Overall 4-wheel vehicle and SCORE Trophy Truck victory at the epic 51st SCORE Baja 1000. Finishing behind Steele, the top five overall 4-wheel vehicle finishers were all SCORE Trophy Trucks. Second overall and in SCORE Trophy Truck was the team of Andy McMillin, San Diego/Gustavo ‘Tavo’ Vildosola, Mexicali, Mexico with a penalty-free time of 16:28:51 in their No. 31 McMillin Racing Mason-built Chevy Silverado while completing the podium was the Rob MacCachren, Las Vegas/Jason Voss, Gilroy, Calif. tandem in a final time of 16:32:57 in the No. 11 MacCachren Motorsports Geiser Bros. built Ford F-150. Finishing fourth overall and in SCORE Trophy Truck was the team of Andy McMillin’s cousin Dan McMillin, San Diego/Gary Weyhrich, Boring, Ore. in a penalty-free time of 16:47:44 in their Mark Racing Racer-built Ford F-150. Rounding out the top five finishers overall and in SCORE Trophy Truck was Las Vegas’ Bryce Menzies who teamed with Australia’s Toby Price to finish in a time16:52:47 in the No. 7 Menzies Motorsports Huseman-built Ford Raptor. Justin Morgan led his team to a perfect season in the 2018 SCORE World Desert Championship, capped by a convincing overall motorcycle victory in the 51st SCORE Baja 1000. Morgan, 28, El Cajon, Calif., led from green-to-checkered to earn his second overall win in this race. Morgan split the riding on the No. 7x Honda CRF450X with Mark Samuels, 28, Yucca Valley, Calif. and Justin Jones, 27, Murrieta, Calif. in a winning time of 16: 23:26 with an average speed of 49.22 mph. His time was also the fastest of all vehicles in the race. It was the first time since 2013 that a motorcycle had the fastest time of all vehicles in the race. In race history, motorcycles have now had the overall fastest time in the race 38 times compared to just 13 for the 4-wheel vehicles. Completing their first season as a team, it was the fourth SCORE Baja 1000 overall motorcycle win for Samuels and the third for Jones. The victory was also the 28th overall motorcycle win in this legendary race for American Honda. Earning prominent COPS Racing of the United States picked up their fourth win as a team in the SCORE Baja 1000. Morgan Langley won the unlimited Class 1 in the No. 150 COPS Racing ESM-Chevy open-wheel desert race car. Morgan Langley, 44, of Manhattan Beach, Calif., shared driving with Paul Keller, El Cajon, Calif. and Mike Malloy, Buckeye, Ariz. There winning time was a near penalty-free 19:35:21. The family team is led by family patriarch John Langley and includes Morgan’s brother Zak. Zak Langley finished eighth in SCORE Trophy Truck (penalty-free 17:19:27) and John Langley ended up 12th out of 29 starters in Trophy Truck Spec (near penalty-free 26:05:33). This year’s race started for the 44th time and finished for the 25th time in Ensenada, Baja California. The start/finish line compound was once again on Blvd. Costero in the heart of Ensenada adjacent to the picturesque Bahia de Todos Santos one side and to the iconic Riviera del Pacifico Cultural Center on the other with the first several spectator-friendly miles running up and back through the Ensenada Arroyo. Motorcycle and quad classes started at 4 a.m. PT on Friday, and the car, truck and UTV classes began their journey in the elapsed-time race at 10:30 a.m. (PT) on Friday. With a 36-hour time limit to become an official finisher, the course for the 51st anniversary race officially closed at 12:59.30 a.m. PT on Sunday. There were a total of 285 starters and 178 official finishers (62.46 percent) racing to Pro and Sportsman classes for cars, trucks, UTVs, motorcycles and quads. The total number of starters was the 15th most in the history of the SCORE Baja 1000. The number of finishers was the 11th most in the 51-year history of the iconic race. As top qualifier Larry Connor/Ricky Johnson/Luke Johnson set the early pace for a SCORE Baja 1000 record-tying field of 36 SCORE Trophy Truck starters and led physically for three-fourths of the race, Rob MacCachren finally took the physical lead and crossed the finish line first but penalties removed the apparent win for MacCachren and Steele just mastered the Baja desert in a deliberate push that kept him near the top spot throughout the race. Earning his fifth career class win in the SCORE Baja 1000 was Clyde Stacy, Bristol, Va., co-owner of the prominent RPM Racing team that had five vehicles running in this year’s race. Stacy, 73, won the SCORE TT Legend division, the class for SCORE Trophy Truck drivers over 50 years of age who chose to run in this class within-a-class. Splitting the driving with Stacy with veteran World Rally Championship and SCORE racer Armin Schwarz, 55, of Germany, as the duo teamed to finish an impressive 10th overall among 4-wheel vehicles while winning their class in the No. 5L Geiser Bros. built Chevy Rally Truck. It was the first career win in this race for the multi-talented Schwarz. Veteran champion SCORE racer Wayne Matlock, 40, dove solo in his Polaris RZR XP4 Turbo to lead all 49 Pro UTV finishers in three different classes while winning his Pro UTV FI (Forced Induction) class to earn the Overall Pro UTV title as well over a field of 29 starters in his class. It was his second class race win of the year and it was his seventh all-time class victory in this epic event. His time was a penalty-free 20:25:18. Winning his third race of the season, legendary veteran Mexican motorcycle racer Francisco Septien, of Ensenada rode flawlessly to capture the checkered in the Pro Moto Ironman class for solo riders. Septien, 42, now has 10 class wins in the SCORE Baja 1000 and he won this race on the No. 730x Honda CRF450X in a time of 22:04:00 over the very rugged course. His time was also the 12th fastest of all motorcycles in the race. While he has won in several motorcycle classes over the years, this was his first win in the Pro Moto Ironman class in this race. Septien finished all four races in his class in the 2018 SCORE World Desert Championship. The Lucerna Hotels & Resorts Tijuana 22nd SCORE Desert Challenge in September was the only race that he didn’t win his class. He finished second in that race. With an ambitious goal to ride solo in the Pro Moto Ironman class as a rookie in the SCORE Baja 1000, SCORE rookie Liz Karcz, 34, a New Jersey transplant who is an ICU nurse at the University of New Mexico Medical Center made it official as she achieved her goal with time to spare. With sheer dedication, determination, perseverance and an indefatigable spirit to survive, Karz, finished in 34:40:14 on her No. 722x Monkey Business Racing Honda CRF450X. As thousands of spectators cheered her amazing accomplishment at the checkered flag in an emotional scene at the finish line are that included her parents and her sister from New Jersey, Karcz finished three of the four SCORE races this year. In her first SCORE Baja 1000, Karcz also finished fifth out of 10 starters (nine males) in her Pro Moto Ironman class. In this year’s SCORE World Desert Championship, Karcz, who won her class in this year’s AMA National Hare and Hound Championship series with a perfect record of seven class wins, previously had also finished both the SCORE San Felipe 250 and the Lucerna Hotel & Resorts Tijuana SCORE Desert Challenge riding for Monkey Business Racing. Karcz was also riding as a charitable fund-raiser, raising charitable funds for the DA8 Strong Foundation. DA8 Strong, founded by former SCORE champion racer Destry Abbott, raises funds to help improve the quality of life for cancer patients and their families. A total of five racers won their class in each of the four grueling races held in 2018. The first two were run over race-record long courses for each event. The only undefeated racer in the 4-wheel vehicle classes was Vincent Munoz, Yucaipa, Calif. (Heavy Metal, No. 894 Ford Ranger). Besides Morgan/Samuels/Jones in Pro Moto Unlimited, the other motorcycle class winners who were undefeated in 2018 with identical 4-0 records after their SCORE Baja 1000 class wins were teams led by Jano Montoya, Winter Garden, Fla. (Peru) (Pro Moto 40, No. 400x KTM 450EXCF), Giovanni Spinali, El Cajon, Calif. (Pro Moto 50, No. 510x Yamaha YZ450FX) and Guy Laycraft, Canada (Pro Moto 60, No. 649x Honda CRF450X). Among the other class winner in 4-wheel vehicle classes were: Bryce Swaim, El Cajon, Calif. (Trophy Truck Spec, TSCO-Chevy), Ruben Torres, San Luis Potosi, Mexico (Class 10, Alumi Craft-Chevy), Bruce Yee, Chula Vista, Calif. (Class 1/2-1600, Alumi Crat-VW), Freddie Willert, El Cajon, Calif. (SCORE Lites, Jimco-VW), Ben Swift, Newport Beach, Calif. (Class 5, VW Baja Bug), Tyler Backus, Canada (Pro UTV NA, Polaris RZR XP1000), Kris Werth, Reddick, Ill. (Pro UTV Unlimited), Can-Am X3 DCR and Larry McRae, St. George, Utah (Baja Challenge, BTC-Chevy). Among the other motorcycle class winners were: Carlos Miranda, Ensenada, Mexico (Pro Moto Limited, KTM 350XCF) and Chad Thornton, Farmington, N.M. (Pro Moto 30, KTM 450XCF). Winning the Pro Quad class for the third time this season in four races was Said Sanchez (Pro Quad, Honda TRX450R). Another history-making result in this year’s epic event saw Raul Rodriguez Jr guide his old 1/2-1600 class vehicle to the first ever finish by an all-electric car in the history of SCORE and the SCORE Baja 1000. Rodriguez Jr, 26 and his father Raul Sr covered the course in their No. E402 battery-powered Raceco 1600 cc open-wheel desert race car to a record-setting finishing time of 32:57:28. This year’s 51st SCORE Baja 1000 included 34 Sportsman racers competing in five total classes. Fastest Sportsman class winners were Diego Lopez, Glendale, Ariz. (SPT M/C, Honda CRF450X) and Danny Magdalena, Acton, Calif. (Honda TRX450R). Officially in Ensenada, there were racers from 41 U.S. States, one U.S. Territory and 19 countries competing. In addition to the United States, the U.S. Territory of Guam and host country Mexico, the other countries with racers entered areArgentina, Australia, Austria, Belgium, Brazil, Canada, Chile, Costa Rica, England, Finland, France, Germany, Italy, New Zealand, Peru, Spain and Sweden. BFGoodrich Tires is celebrating over four decades as a major player in SCORE Baja racing. In addition to being the official tire of SCORE International for over four decades, BFGoodrich Tires has produced the tire of choice for 31 of the overall 4-wheel vehicle winners in the SCORE Baja 1000, including 30 of the last 33 years along with a record-run of 20 straight from 1986 through 2005. In total, BFGoodrich Tires has now be the tire of choice for the overall 4-wheel vehicle winner in 91 SCORE Baja races including 32 in the SCORE Baja 500. BFGoodrich Tires also awarded $25,000 contingency bonus money to the overall winners of this year’s SCORE Baja 1000 who ran exclusively on BFGoodrich Tires. Celebrating its 25th anniversary, SCORE Trophy Truck, developed and launched by former SCORE owner Sal Fish in 1994, is the marquee racing division in the sport—for high-tech, 950 horsepower unlimited custom trucks and SCORE TT Legend, which debuted in 2017, is the SCORE Trophy Truck class-within-a-class with drivers at least 50 years old. This was the 131st SCORE race that included SCORE Trophy Trucks in its 25-year history. In the probably the most unique way to put your name in the SCORE record books, Mexico’s international motorcycle rally racer Santiago Creel has entered seven vehicles in this year’s race (six KTM motorcycles and one truck in Trophy Truck Spec. SCORE rules require a driver/rider of record to either start or finish the race in order to receive points for the event. With plenty of help from plenty of teammates, including Monkey Business Racing team co-owner Mark Winkelman of Texas, Creel, 32 of Mexico City, was rider of record on four of the motorcycles—No. 4x and No. 66x in Pro Moto Unlimited class as well as No. 100x in Pro Moto Limited and No. 360x in Pro Moto 30. He is also listed as a co-rider on the No. 25x in Pro Moto Unlimited (Italy’s Massimo Mangini is ROR) and No. 310x in Pro Moto 30 (Mexico’s Enrique Fuhrken is ROR). Creel’s ‘craziness’ also called for him to drive a section in the No. 252 Trophy Truck Spec of DOR Gonzalo Pirron. People really did need a SCORE-card to keep up with Creel and his Monkey Business Racing team. In addition to season class point championships and SCORE World Desert Championship overall point titles, the racers were also competing for part of nearly $400,000 in cash purse and contingency postings. Drivers are also attempting to earn prestigious SCORE Milestone Awards given to all racers who complete every required mile of the race season. These awards are being presented by SCORE for the 33rd consecutive year. For this year’s 51st SCORE Baja 1000, SCORE International selected Mexico’s beloved tourism official Nico Saad, the only person who has been behind the scenes at all 50 of the previous races, as the Grand Marshal for this year’s anniversary of the world’s most iconic desert race.